The River Washburn, a tributary of the Wharfe, and the four large reservoirs of the Washburn Valley, provide the main water supply catchment area for Leeds. Except during water releases, the river joining the reservoirs is normally dry and canoeing impossible. However, on about 30 days in the year, water releases for canoeing purposes are made. This provides 2.4km (1.5 miles) of fast flowing Grade 2-3 water between the two reservoirs is the only dam-release facility in England. Development work in recent years has seen improvement works in the lower river adding further interest for paddlers, and the acquisition on the wood yard site at the bottom of the river provides easy egress and dedicated park for those running the full river. 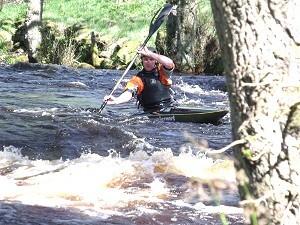 The river has three slalom sites catering for differing standards of competition, and currently hosts and Division 1 and 2 slaloms. 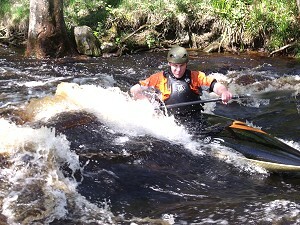 Slalom events usually take place on the top section of the river from the car park finishing above the second footbridge where paddlers can egress. This provides a fast section of water down through the first footbridge where large rocks provide good eddies. A fast but more gentle section follows, characterised by tight eddies, often behind trees that line the bank. This leads down to the small weir that can provide a straight shoot through the stopper or a challenging line depending on how the gates are set. Another fast section through standing waves take you down to the egress eddy by the footbridge, look out for the surf just before the get off. The next section of river has been used for Prem and Div 1 races, starting by the footbridge with a fast section down to a bend in the river. Another fast but more gentle section follows before the river bends and the lead in to the large weir, with races on this section finishing just below. Beyond here the river provides interest all the way to the wood yard for those that wish to explore it. Other events at Washburn currently include Wednesday evening and weekend cruises where you can paddle the whole river or just walk for the sections used in slalom events, as well as freestyle and wild water racing events. 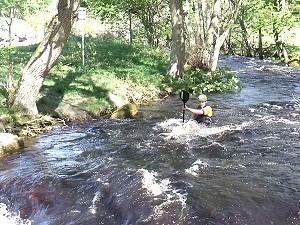 On slalom and WWR race days, parts of the river not in use by the event can normally be used by non-racing paddlers for recreational cruising by prior arrangement with the event organiser.